A young man whom I had known since he was in high school stopped by to see me and proudly display his new MBA. "I know a master's degree alone doesn't guarantee success," he said. "What do you think is the most important quality for someone who wants to become a business leader?" I answered without hesitation: The ability to communicate. Individuals who communicate effectively with people at all levels, of both genders, and from a variety of cultures and backgrounds are today's pacesetters. In the old-style hierarchical, authoritarian setting, communication is relatively simple. The top person tells the underlings to jump, and the underlings need only ask, "How high?" In a modern organization, communication requires more finesse. The leader is not a transmitter of commands but a creator of motivational environments. The workers are not robots responding to switches and levers, but thinking individuals pouring their ingenuity into the corporate purpose. The corporate ideal is not mechanical stability, but dynamic, innovative, continuous change. The leader who can't communicate can't create the conditions that motivate. The genius who can't communicate is intellectually impotent. The organization that can't communicate can't change, and the corporation that can't change is dead. Human infants have an inborn desire to communicate, and that desire enables them to pick up words quickly and to enlarge their vocabularies continuously. That same kind of desire can enable you to enlarge your stock of words and improve your skill in employing them. Demosthenes, the Greek orator, had a desire to achieve eloquence after he was hissed and booed off the platform in Athens. He cultivated the art of speech writing, then went to the shores of the Aegean Sea, where he strengthened his voice by shouting into the wind for hours at a time. To improve his diction, he practiced speaking with pebbles in his mouth. To overcome his fear, he practiced with a sword hanging over his head. To clarify his presentation, he studied the techniques of the masters. Today, more than 2,000 years later, the name Demosthenes is synonymous with oratorical eloquence. Reduced to basics, communication consists of sending and receiving messages. Language is the primary conveyer of thoughts and ideas. It turns abstract concepts into words that symbolize those thoughts. Those words take the form of spoken sounds or written symbols. If the mind can immediately translate the sounds and symbols into mental pictures, communication becomes much more vivid and much more meaningful. If I say "I want a desk for my office," my listener has only a vague and general idea of what I want. If I say "I want a brown walnut desk," the listener has a more vivid mental picture. The more skillful you become at conveying images, the more effective your communication will be. (3) Master the basic skills. Some people think the first requisite for good communication is an exhaustive vocabulary. Some people think it's impossible to communicate well without first absorbing a heavy dose of grammar, then memorizing a dictionary of English usage. Words are important. Good grammar is important. And yes, it helps to know which words and expressions are considered standard and which are considered substandard among educated people. But slavish allegiance to the rules of grammar can actually impede communication. People will sometimes go to great lengths to avoid usage that somebody has pronounced "ungrammatical" or "substandard." In the process, they forget the most important rule of communication: Make it clear and understandable. The vocabulary you use in every-day speech has probably served you well. You use the words that you understand. Chances are, they're the words your friends, colleagues and employees understand. If you try to use words beyond the vocabularies of the people you're trying to communicate with, you're not communicating; you're showing off. Read the Gettysburgh Address, the Sermon on the Mount or Robert Frost's poetry. The communications that endure are written in plain, simple language. I remember a story that gave me inspiration. A young musician had listened with awe as a piano virtuoso poured all his love and all his skill into a complex selection of great compositions. "It must be great to have all the practicing behind you and be able to sit down and play like that," he said. "Oh," said the master musician, "I still practice eight hours every day." "But why?" asked the astounded young man. "You're already so good!" "I want to become superb," replied the older man. 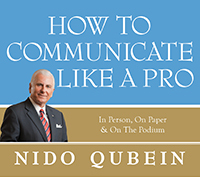 I teach communication skills to thousands of people each year, through seminars, CDs, DVDs and books. Most of the people I reach are content to become good. Few are willing to invest the extra effort to become superb. To become superb, you have to practice. It isn't enough to know what it takes to connect with people, to influence their behavior, to create a motivational environment for them, to help them to identify with your message. The techniques of communication have to become part of your daily activity, so that they are as natural to you as swimming is to a duck. The more you practice these techniques, the easier you'll find it to connect with people, whether you're dealing with individuals one-on-one or with a group of thousands. Nobody becomes a polished, professional communicator on the first try. It takes patience. A few years ago, William White, a journalism and English instructor, edited a book of early writings by Ernest Hemingway. The young Hemingway was a reporter for a Toronto newspaper, and this book was a collection of his articles written between 1920 and 1924. The writing was good, but it was not superb. It gave a faint foregleam of the masterful storyteller who would emerge in The Old Man and the Sea, but it wasn't the Hemingway of literary legend. Experience. The genius was there all along, but it needed to incubate. The sands of time can abrade or polish. It depends on whether you use your time purposely or let it pass haphazardly. Acquiring skill as a communicator requires constant, careful, loving attention to the craft. The cub reporter didn't transform himself into a successful novelist through one blinding flash of literary insight. Like most people, he progressed from the "good" to the "superb" through hundreds of tiny improvements from day to day. You can use the five keys to effective communication in many settings, under a variety of circumstances. You can be a virtuoso at inspiring your work force, at negotiating business deals, at marketing your products and at building a positive corporate image. All these are important communication skills. But always remember: Whatever communication task you undertake, your objective is to connect with people.